When actor Joel Edgerton decided to pop behind the camera for 2015’s The Gift, which he also starred in, alongside Jason Bateman and Rebecca Hall, it felt as if that maybe more the direction, as it were, his career was going to take him. It seems his day job put a stop to that, ultimately, as he’s only now gotten around to directing again, this time with completely different subject matter. 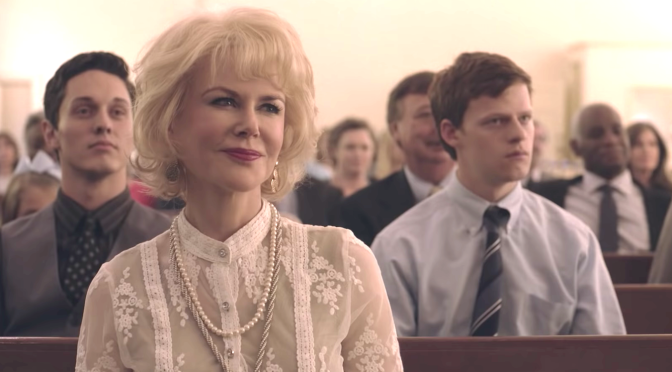 You may be the star, but hell, I'm Nicole Kidman! Jared (Lucas Hedges) lives in the Southern, god-fearing state of Arkansas, with his loving parents. They are concerned for his well being though, and with the aim of helping him, send him to Love in Action. With a name like that, how could it be anything other than a place offering help and advice to those in a confused state of mind? As it turns out, it’s actually gay conversion therapy; a ‘safe’ haven for those evil, non-heterosexual thoughts to be brainwashed right out of you. Like most people there, Jared is confused about his sexuality, and although chief therapist Victor Sykes (Edgerton) appears to be well meaning, the longer he stays there, the more Jared questions whether it’s actually the right thing for him, or anyone else there, for that matter. I can hold this pose for three day and 17 hours. You? Although the premise sounds like a borderline sci-fi flick, where youngsters are committed to these dark places to be mentally mutilated into believing homosexuality is a sin, it’s actually based on the memoir of the same name by Garrard Conley, who underwent this highly dubious regime under the name of therapy. Maybe it’s because Edgerton once again decides to act in a film he directs, taking on more than he can possibly handle, that his direction seems patchy at best, with an unclear timeline of events, as well as leaving out some fundamental questions. The biggest is the decision by his parents to send Jared to such a place in the first place. It probably comes from a well-meaning place, but Edgerton decides to give the emotional reasons for their decision a complete miss. Instead, he chooses to offer somewhat sympathetic portrayals of mom (Nicole Kidman) and dad (Russell Crowe), which just doesn’t wash. It also lacks emotional depth elsewhere; Hedges, who was Oscar nominated in 2016 for his supporting role in Manchester by the Sea, gives a somewhat stilted account of himself throughout. It’s clearly a traumatic time, and yet Hedges delivers an even keel performance, offering very little in the way of highs and lows his character must be going through. In fact the biggest upset of the film doesn’t come until the end credits roll, when it displays how many US states still allow these types of facilities to exist. As a premise, it’s thoroughly intriguing to think such places operate; it’s just disappointing that Edgerton’s execution is so flaky and conservative, failing as it does to get into the minds of those poor, sick souls that believe hetero is the only way to go.